What is the low down on these high voltage gloves? Until hybrids hit the roads in the U.S. of A. some 16 years ago, two types of gloves were in use, the “keep my hands clean” and “stop ripping my flesh” type. As a tech for years (starting in the workforce in 1967), it was no gloves. Dirt and cuts were a right of passage as no “real” mechanic would wear gloves of any type. Gloves were for sissies. Battery acid in a cracked finger joint was met with a grimace and work just went on. Gasoline was used as a cleaning solvent as it was plentiful and worked just great as did choke-n-carb. For the real tough stuff, 140 psi of compressed air was always ready for blasting away dirt that many times ended up in our eyes. Oh, the good old days. Today, protective gloves are an accepted practice. Most you have mechanics gloves of some sort so C V joint grease is smeared on those thin latex gloves rather than your skin. NASCAR made “mechanics gloves” popular a decade ago but now we have a more compelling reason to use gloves, life or death. High voltage systems integrated into the drive line or air conditioning system are common place. By the end of 2015 over three million hybrids were registered and driven in America, plus 250,000 with plugs. Almost 8 million worldwide and most of these hybrids will sport high voltage as an advantage over the conventional gas or diesel engine. Orange is the new color of power. Do you own a pair of high voltage gloves? Are they rated Class O at 1000 volts? Or Class OO at 500 volts? Do they have rolled cuffs or are they straight cut? Black all the way through or layered with color? Has the date stamped on the glove exceeded six months or have they been re-tested recently? What about storage? Leather outer protectors? My word, do I really need to know all this? Yes sir re! Linesman gloves, as they are often referred to, are not new to industry but like many technologies it has found its way into the world of wheels. As little as ¼ amps at 60 volts can be fatal and most hybrids can deliver and sustain that amount and a lot more. What Hybrids require HV GLOVES? Once you see the word hybrid on the car open the hood and look it over. Lexus will only use a small “h” after its letter/number designation to alert you. You will either see orange or blue cables. Both are hybrids but only the orange cabled car is high voltage, 60 volts or more. 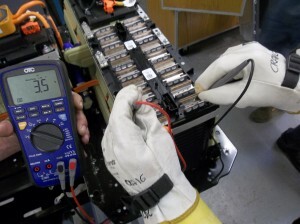 Blue cabled vehicles are known as a micro hybrid and carry only 36 volts in its hybrid battery. No gloves required at that level but many techs use them anyway. Once you know you have a hybrid and what voltage type (High or Medium) the next step is to protect yourself. When you are not 100% sure that the part of the car you are handling is not powered up with high voltage then get those gloves on. Don’t just slide them on though, test them first. A simple test is to roll up the glove until the fingers inflate. A pin hole is all it takes to allow voltage to contact your skin and get into your organs. Every six months send them to a testing lab or ACDC where they can be stressed tested. I recommend owning two sets purchased three months apart. That way you can have a back-up glove if you damage one and also have a set handy while one set is being tested or if you use ACDC we will send recently tested gloves to you and swap out your old ones. How to I pick out a good set of gloves? In North America they will have rolled edges, are Class O rated to 1000 volts. Some will have an outer color that is bright with a black inner color. Many good gloves come in a bag that protects them from sunlight and damage. Many hybrids components have sharp edges so make sure you have leather protectors (another glove) that slide over the HV rubber ones. And not just any leather glove as the leather can be treated with chemicals that will damage the rubber ones. What is a good fit? To figure out your size, wrap a cloth measuring tape around the palm of your hand without going over your thumb. Whatever that number is add 1 inch. Gloves that fit loosely are better than a tight fit. If you can slide the glove off by pulling on the center finger-tip without it binding, that is the right size. Small gloves make sweaty hands and sweat is conductive. Do I have to wear them all the time? Until you have had hands-on high voltage hybrid training on all the makes and models you work on, I would say “yes” in the beginning. Once you understand the systems, how to power down the HV and test for HV, have the correct meters, safety equipment then you will use the HV gloves only when exposed to HV. High voltage systems have become common place so protecting and educating yourself is not optional, it is mandatory. What is done at the 6 month test? When a high voltage glove is in use for 6 months they are sent to a testing lab. Once they arrive they are inventoried and marked with the testing labs name and a code to identify each glove. Then they are inflated like a balloon with a special tool that you can buy for under $100. If the glove fails this test, either by leaking or showing damage, a new glove is provide and the bad glove has the cuff cut off. After this test is done, the glove is cleaned in a commercial washer and drier. It is important for the next test that no oil is on the glove. 10 or more gloves with the fingers down are attached to a bar suspended over what looks like a large aquarium. This machine is going to supply the voltage they are rated at and enough current to stress test the ability of the rubber to protect you against a shock. The glove are filled with water and lowered into the tank below. This is a fully automated machine. Once the water in the gloves, about 1/2 inch or 13mm from the top, equals the ware in the tank a rod is lowered into the open glove. This is where your hand would be and then the rod is powered with DC power and the glove is used to insulate the rod from the water in the tank. 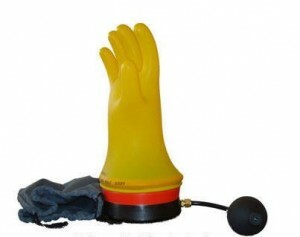 If the glove has any damage the electrical current will find its way through the rubber glove (except the small area at the cuff that is protruding from the surface pf the tank). If that happens an alarm will sound, a light will illuminate above the defective glove and the test will abort. The operator of the machine will remove the glove, cut the upper part of the cuff and a new glove will be sent to the customer. There is a protective clear window that automatically raises and keeps the operator from reaching into the machine while it is testing. These machines are expensive and a wait time of 2 to 3 weeks is not unusual when sending your gloves out for testing. If the gloves pass all the tests a new date is stamped onto the glove and the old date removed. Most testing companies will us the date; month, day and year they were tested but we have seen some companies use a date stamp that tells you when they expire. Read the label carefully. If your glove fails you will be notified and a new glove (right or left) will be sent with the other glove that passed. The pass rates are very high. Most failures are damage to glove when used without leather protectors or foreign matter in the fingers that push into the inner fingertips. Store your gloves with gingers up in your storage bag. We asked the testing companies how long a pair of HV gloves can last. The answer is decades. There is no expiration date. The care of the gloves and the environment they are used in makes a big difference. An auto repair shop has many chemicals that will ruin the gloves. Never use them in a parts washer or spray any cleaning chemicals on them. At ACDC we have been selling gloves for about 6 years and have visited these testing facilities. Getting one pair of gloves tested is about 25 to 30 US dollars, but when done in bulk the test can be done for under $10. Prices varies widely in America. ACDC offers a small glove kit, an upgraded magnetic bad to place over the door handle to keep people away for the car, and larger kits with other safety items. As far as we know we are the only company that will send your replacement gloves before yours expire so you stay in compliance. When you buy a pair of Safety Gloves for Hybrid, Plug-in and Electric Car work, you can sign up for ACDC Glove Testing. OSHA has a “gray area” in their rules. You have 6 months from “First Use” after you buy the gloves to have them re-tested. Well, try explaining that to an OSHA official. You may note that the gloves you bought have a date on the cuff. That was the day they were tested. All HV Gloves must be tested before they can be sold. Unlike most other glove retailers, ACDC tests our gloves before you buy them so they are ready to ship ASAP. The date may be expired, but don’t panic, all is OK.
ACDC Testing Program (ATP): every 6 months you get a pair of HV Gloves (recently tested) sent to you 2 weeks before yours expire. Then you put your expired gloves back in the in the pre-addressed and stamped envelope and return them to ACDC. 6 months later we do it again. No worries about being unsafe or out of compliance. 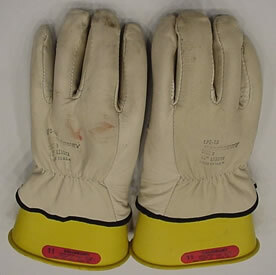 OSHA does visit shops to see if you work on hybrids and require this type of glove at work. They need to be tested every 6 months, 6 months from first use. Fees: $90 per year per pair gets you 2 tests. You renew each year at $90.